The relentless drive for warehouse efficiency is sparking new interest in self-driving vehicles. For those wondering which type to buy, experts say forget the labels and focus on capabilities. The manual warehouse is fast becoming a thing of the past. These days, DCs are increasingly turning to automation as they struggle to cope with a surging tide of e-commerce orders in the midst of a worsening labor shortage. Vendors have stepped up to the demand. As a result, DC managers now have an unprecedented array of automated material handling systems to choose from. Options range from classic conveyor belts to automated storage and retrieval systems (AS/RS) and now to the latest entrant, autonomous mobile robots (AMRs). But, wait a minute. As any warehousing veteran can tell you, mobile robots are hardly new to the DC. Robots known as "automated guided vehicles," or AGVs, have been a fixture in many operations for decades, ferrying goods throughout the facility without the benefit of a driver. So how does this new entrant, the AMR, differ from the AGV? And how does it fit into the big picture where materials movement technology is concerned? Does it represent the way of the future, or is it just a new variation on a well-established theme? Industry experts say it depends on how you define the terms. Recent technology breakthroughs have improved the capabilities of both AGVs and AMRs, blurring the lines between them and creating a marketplace full of diverse tools that can be matched to almost any logistics task. To understand the difference between traditional AGVs and the newer AMRs, it helps to know a little about the vehicles' background. The AGV has traditionally been defined as a kind of robotic cart that lifts and ferries loads around a facility without human assistance. Although it doesn't rely on a driver for navigation, it does require external guidance—electric wire buried in the concrete floor, lines of magnets, tape, beacons, or reflectors. The main rap on these vehicles is that changing that path—say, to accommodate a new product, a new client, a new facility, or a reconfigured workflow—can be time-consuming and expensive. The AMR, by contrast, is a self-guided vehicle outfitted with software and intelligent sensors that enable it to navigate its own path around the DC. It's that capability for onboard navigation that sets the new breed of self-driving warehouse vehicles apart from their predecessors, said John Santagate, research director for commercial service robotics at IDC Manufacturing Insights, an analyst group based in Framingham, Mass. By using suites of onboard sensors and processors, AMRs can perform complex tasks like simultaneous location and mapping (SLAM) to "learn" their way around a new site. They rely on artificial intelligence (AI) to sense and respond to a changing environment, and to optimize their routes. Some AMRs can also leverage "swarm intelligence," meaning they're able to exchange data with other units through wireless networks and adjust their operations based on what they learn. That means they can, say, adjust their paths based on information received from other units, much the way drivers do on a crowded highway, or even "teach" new arrivals how to navigate a particular warehouse. That's a key advantage of those models and some next-gen AGVs—one that conventional AGVs can't match. There's no doubt that AMRs are the hot technology of the moment, as indicated by high-profile deals like transportation and logistics giant XPO Logistics Inc.'s recent purchase of 5,000 mobile robots from GreyOrange Pte. Ltd. for use in e-commerce fulfillment. That notwithstanding, AMRs are still a young, emerging technology, according to IDC's 2018 Autonomous Mobile Robots in the Warehouse and Fulfillment Center MaturityScape Benchmark Survey, which looks at the current state of AMR deployments in fulfillment operations. The study showed that 47.2 percent of users were still at the "ad hoc" or "opportunistic" level of AMR adoption, running only sporadic or pilot programs, while 33.8 percent were at the middle "repeatable" stage, where they are just beginning to expand their deployments. That leaves 15.2 percent at the advanced "managed" stage of maturity, where they are achieving competitive advantage through AMRs, and just 3.8 percent at the fully "optimized" stage of widespread adoption, IDC found. By contrast, AGVs are entrenched in many U.S. logistics facilities, with operations that have been running for decades and are on track to continue for years to come, Santagate said. In those cases, companies introducing AMRs into their operations will most likely use them in combination with AGVs and other automated equipment, with the units all working together in a symphony of machines. Like Santagate, systems integrator Dematic, a division of German material handling giant Kion Group AG, doesn't see AGVs going away anytime soon. In a white paper titled Automated Guided Vehicles (AGVs) vs. Autonomous Mobile Robots (AMRs): Debunking the Myths, Dematic argues that AGVs will continue to fill an important role in the warehouse for some time to come, relieving human workers of nonvalue-added repetitive material movement tasks. Although some AMR proponents might give the impression that AGVs are antiquated and obsolete, that's misleading, the company says. Leaps in AGV technology in the last 10 years have added new weapons to their arsenal, including vision-based guidance, dynamic routing, and three-dimensional (3-D) sensors. In the meantime, the categories of mobile warehouse vehicles continue to evolve, muddying the waters for those who contend AMRs are defined by the navigation sensors they carry, said Jeff Christensen, vice president of products at Seegrid Corp., an AGV firm that makes vision-guided vehicles. Seegrid sees a future where autonomous onboard navigation will become a requirement for new warehouse vehicles. "Dependent navigation is very predictable; when people buy that, they're not buying a cool machine; they're buying predictability," Christensen said. "But in DCs where every pallet is going a different route to a different location, fixed routes are untenable" because of guidepath infrastructure limitations. The market could soon have greater clarity on the navigation question, he said. Today's warehouse operators are being squeezed by multiple market forces, including a DC labor shortage; the challenges of filling small, multiple-SKU (stock-keeping unit) orders; and shorter delivery times demanded by e-commerce customers, he noted. In an effort to address those pain points, companies are using whatever technology can produce the quickest results. "There's a substantial installed base of AGVs and people will continue to run them maybe until they go into the ground," Christensen said. "But for companies looking to make a decision today, picking something with fixed guidance is nine times out of 10 not the right choice." AGV vendor and systems integrator Knapp AG sees many of the same trends playing out, according to Kevin Reader, the company's vice president of business development and marketing. In response, the company has introduced AGVs whose capabilities extend far beyond following fixed paths, he noted. For example, Knapp's current family of "Open Shuttles" can dynamically sense obstacles in their path and communicate with other AGVs, Reader said. In the end, he said, vehicle choice isn't just about the best way to automate a single process. It requires a more holistic view of the workflow. "You have to look at [vehicles] in the context of the whole operation, and then calculate the cost per order or cost per case or cost per tote, depending on your operation," Reader said. To that point, he added that regardless of the type of vehicle you pick, the greatest gains are likely to come from combining the automated equipment with software-based approaches to warehousing distribution. Today's DCs, he noted, are poised to start reaping big benefits from tools like predictive modeling, analytics, big data, actionable insights, Internet of Things-enabled predictive maintenance, bottleneck detection, and AI. Fetch Robotics' Freight500 autonomous mobile robot is designed to transport workloads up to 1,100 lbs. When it comes to vehicle choice, it may not necessarily be an "either-or" question. Different approaches each have their own benefits, says Melonee Wise, CEO of AMR vendor Fetch Robotics, a fast-growing firm that recently landed a deal with industrial heavyweight Honeywell International Inc. to supply its AMRs for e-commerce DCs. According to Wise, the fast-growing AMR sector has produced a range of distinct vehicle designs. Some AMRs are engineered exclusively for order picking, essentially turning the DC into a virtual AS/RS by providing mobile access to static inventory. Others support more varied applications, including tasks associated with processes like forward picking, reverse logistics, and manufacturing. Given the wide range of potential applications, these AMRs don't even compete directly with each other, much less with existing automated platforms. "Just because we now have AMRs, do you think AS/RSs are going away? I don't," Wise said. The key challenge for customers is to pick the right robotic technology for the problem they're trying to solve, she said. For example, it would be a waste of resources to dedicate a fast-moving robot to a rack of seldom-needed goods because the AMR would sit idle much of the time awaiting a call. "Imagine if Amazon put slow-moving goods in a case with a Kiva?" Wise asked, referring to the squat orange robots used in Amazon.com's DCs to ferry products to order pickers. "You'd have a really expensive, million-dollar battery-filled paperweight!" 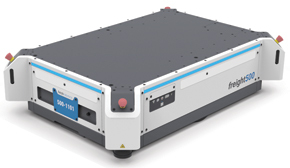 AMRs may have made a flashy debut on the self-driving vehicle scene in recent months, but AGVs are still the king of the prom, if popularity is measured by installed base and total miles driven. Only time will tell whether there's room for both types of driverless vehicles in the logistics universe. But experts agree that they show great promise for solving some of today's most intractable logistics challenges, as business pressures and new technologies continue to drive the development of intelligent, flexible self-driving platforms. Feedback: What did you think of this article? We'd like to hear from you. DC VELOCITY is committed to accuracy and clarity in the delivery of important and useful logistics and supply chain news and information. If you find anything in DC VELOCITY you feel is inaccurate or warrants further explanation, please ?Subject=Feedback - : AMRs and AGVs rev their engines">contact Chief Editor David Maloney. All comments are eligible for publication in the letters section of DC VELOCITY magazine. Please include you name and the name of the company or organization your work for.